In endodontics, conventional intraoral periapical (IOPA) radiographs have been the mainstay for diagnosis, working length determination, and posttreatment disease progression. It is recommended to expose three angulated X-rays to gain spatial or buccolingual understanding of the complex root canal anatomy. However, it has an inherent limitation, i.e., it is a two-dimensional (2D) representation of a three-dimensional (3D) object. In addition, geometric distortion of anatomic structures can compound the errors. Hence, interpretation of X-rays can be a challenge for even the most astute clinician. Last decade has seen the advent of cone beam computed tomography (CBCT) for imaging of the maxillofacial structures. It has taken precedence as an imaging modality due to its 3D volumetric rendering, low radiation dose, image accuracy, and rapid scan time. It is specifically indicated for endodontic cases (untreated or previously treated teeth) that present with contradictory or nonspecific clinical signs and symptoms and where planar radiographic examination is inconclusive. This paper discusses three cases wherein the diagnosis that was established on the basis of 2D imaging changed when they were subjected to CBCT. A 35-year-old male reported with a chief complain of sensitivity in left upper back jaw region. Medical history of the patient was noncontributory. Dental history revealed that maxillary first molar tooth (#26) was root canal treated 3 months back. At present, the tooth was tender to percussion. 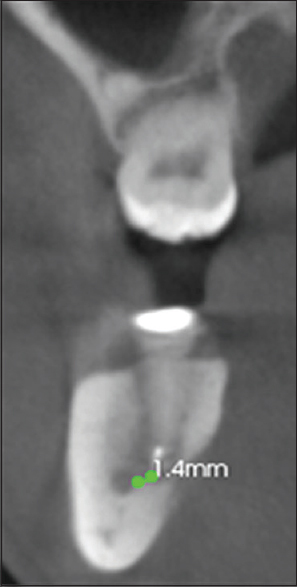 IOPA X-ray revealed satisfactorily obturated canals; however, a radiolucent line running parallel to the obturated mesiobuccal canal was discernable [Figure 1]. A provisional diagnosis of missed MB2 canal was established. Nonsurgical endodontic retreatment was planned. The patient was explained in detail the treatment plan, prognosis, and possible outcome. Reaccess to the chamber was gained. The obturated mesial orifice was identified. Troughing was done with ultrasonic tip (StartX 2) 0.5–3 mm mesially and apically along the mesiobuccal pulpal groove under dental operating microscope (Carl Zeiss, Proergo, Germany). Unfortunately, the MB2 canal could not be located. The patient continued to experience discomfort and sensitivity to cold. 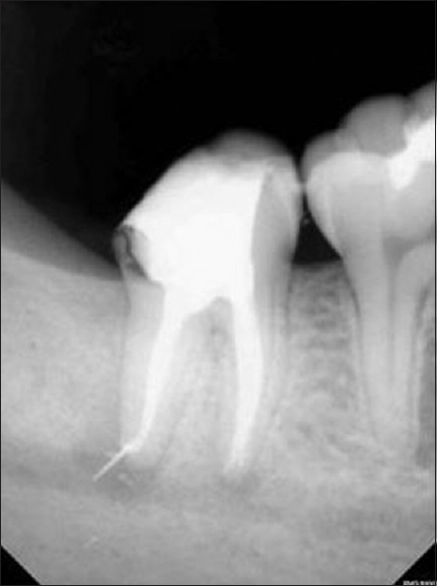 Since no cause could be identified clinically or on 2D radiographs, it was decided to subject the tooth to 3D imaging. The patient was explained again and a written consent was obtained. An ultra-low radiation dose scan (CBCT) was done using a limited field of view. The images were reconstructed at 0.2 mm thickness increments. Axial and sagittal sections revealed the presence of missed mesiobuccal (MB1) canal which was located far buccal to its typical position [Figure 2] and [Figure 3]. It was prepared and obturated. The tooth was restored. At 12 months' follow-up, the patient was asymptomatic. A systemically healthy 15-year-old boy reported with a complaint of pain and pus discharge from upper front teeth for the past 6 weeks. Dental history revealed that the patient had sustained a trauma 10 years back for which he had sought endodontic intervention. On examination, the left maxillary central incisor (#21) was tender to palpation and percussion. There was an associated intraoral draining sinus. IOPA X-ray revealed gross destruction of the coronal one-third and remnants of gutta-percha in the middle third of the canal [Figure 4]. Provisional diagnosis of chronic apical periodontitis associated with inadequate endodontic treatment was made. Nonsurgical retreatment of tooth #21 was planned. The patient was explained regarding the treatment plan and prognosis. Informed consent was taken. 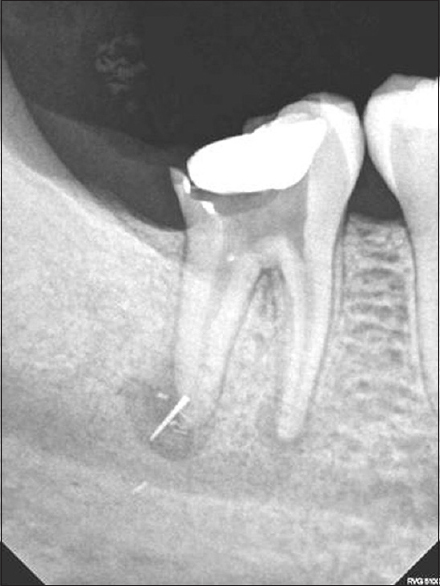 After modification of the access opening, entry was gained into the root canal. An attempt was made to retrieve the gutta-percha from the apical third of the canal. However, in spite of all the efforts, the gutta-percha could not be recovered [Figure 5]. To gain a better understanding of the status, the tooth was subjected to 3D imaging. CBCT scan (3D Imaging Centre, Delhi, India, CS 3D Imaging Software 3.3.11; 5 × 5) was performed as per technical specifications mentioned above. 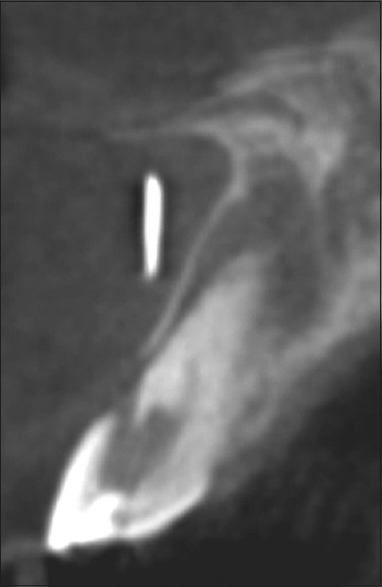 Axial and sagittal slices of CBCT revealed a labial supracrestal perforation and extruded guttapercha cones in the labial soft tissue [Figure 6], [Figure 7] and [Figure 8]. Further investigation of different (sagittal) sections revealed the presence of two gutta-percha cones. The thorough chemo-mechanical preparation was carried out. Apical mineral trioxide aggregate (MTA) (ProRoot, Dentsply Tulsa Dental Specialties) plug was created, labial perforation repaired with Geristore (Den-Mat, Santa Maria, CA, USA), and orthograde obturation with thermoplasticized gutta-percha was accomplished [Figure 9]. At 12 months' follow-up, the patient was asymptomatic, and IOPA X-ray revealed satisfactory healing [Figure 10]. A 32-year-old Asian male reported to the specialty clinic with a chief complaint of intermittent dull ache in the right lower back jaw for the past 1 month. Medical history was noncontributory. He had undergone root canal therapy in relation to the right mandibular second molar tooth (#47) 3 months before. Clinically, the tooth was tender to percussion, and the buccal vestibule adjacent to the tooth was tender on palpation. IOPA X-ray of tooth #47 was exposed. It revealed inadequate endodontic therapy. A separated instrument in the apical third of the distal root was noticed. It appeared to be protruding and impinging on the mandibular canal [Figure 11]. Two more IOPA X-rays taken with a change in horizontal angulation were unable to confirm the exact location of the separated instrument in relation to the mandibular canal [Figure 12] and [Figure 13]. To achieve a definite interpretation, the tooth was subjected to 3D imaging. CBCT scan was performed as per technical specifications mentioned above. The coronal section revealed a large periapical pathology communicating with the mandibular canal. The scans further revealed that the separated instrument was partially beyond the confines of the distal root but was not impinging on the mandibular canal; rather, it was exactly 1.4 mm away from the neural canal [Figure 14]. Due to the anatomic limitations (root apex close to the mandibular canal), a decision to do intentional reimplantation instead of surgical intervention was taken. 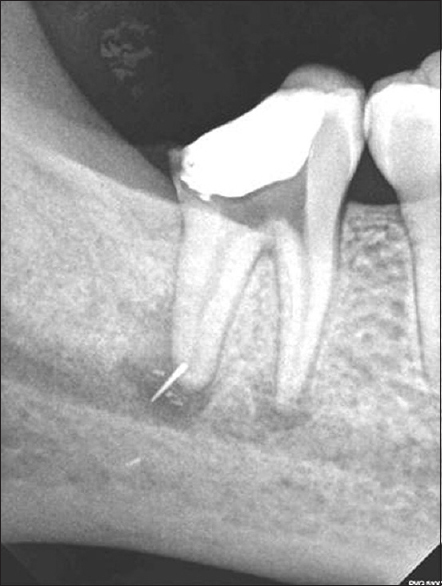 Nonsurgical endodontic therapy was carried out, and the tooth was restored [Figure 15]. 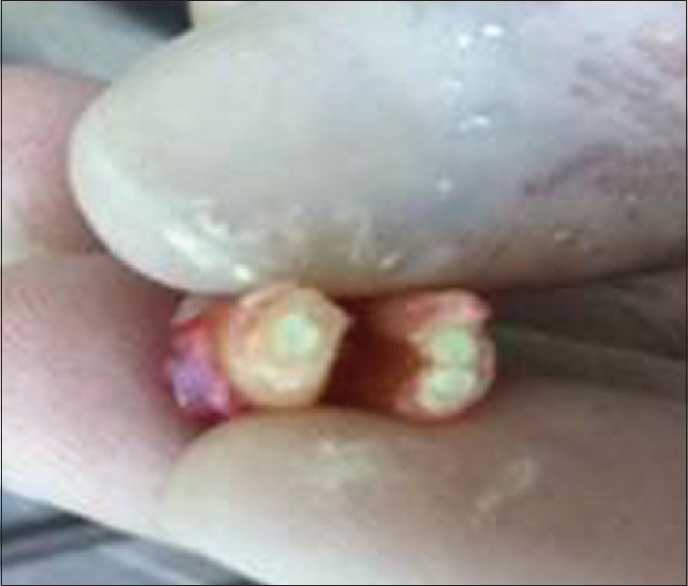 Subsequently, under aseptic conditions, the tooth was atraumatically extracted. The separated instrument could be seen extruded from the distal root. 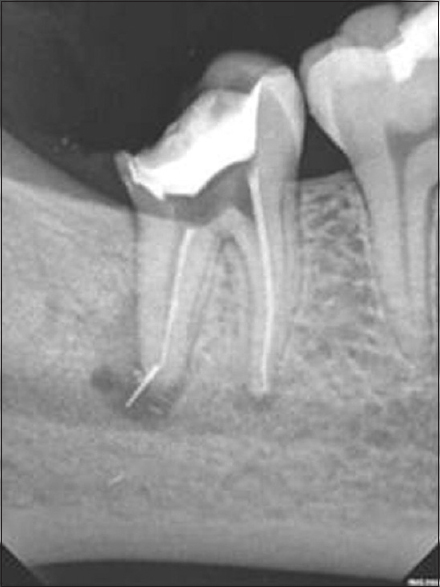 Apicoectomy and retrograde MTA (Pro Root, Dentsply Tulsa Dental Specialties) were performed on both the roots [Figure 16] and [Figure 17]. Extraoral time was <5 min. The tooth was reimplanted and sling sutures were placed. 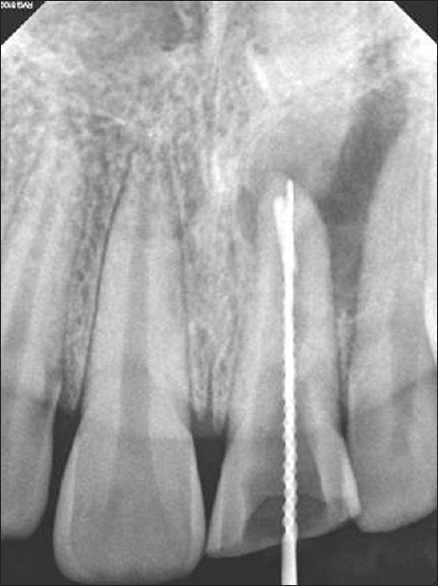 At 12 months' follow-up, the patient was clinically asymptomatic, and there was no radiographic evidence of replacement resorption [Figure 18]. This paper highlights three cases where successful treatment was executed based on the valuable information provided by CBCT. The incidence of a true MB2 orifice in maxillary first molars is 84%. Normal location of a MB2 is mesial to or directly on a line between the MB1 and palatal orifices within 3.5 mm palatally and 2 mm mesially of MB1 orifice. In case 1, the operator mistook the MB2 to be MB1 due to its atypical location and its large dimensions that matched MB1. The CBCT scan revealed that the actual MB1 was located far more buccally than its usual position. Based on the exact measurements done on CBCT scan, troughing was done buccally and the MB1 orifice was located and successfully managed. 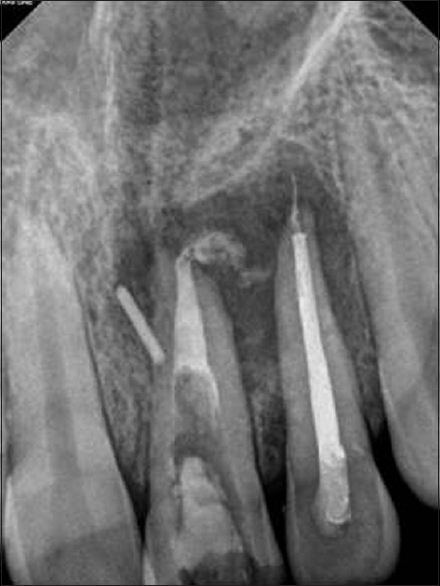 In Case 2, in spite of multiple angulated IOPA X-rays, the gutta-percha seemed to be omnipresent in the apical third of the root canal. This was primarily because IOPA X-ray is a 2D representation of a 3D object. 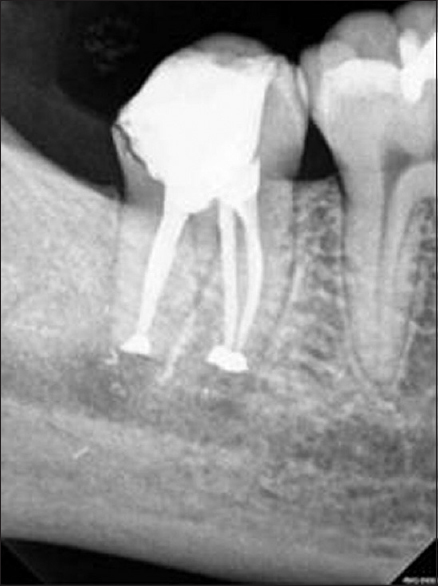 In all the angulated X-rays, the gutta-percha was being superimposed on the canal leading to this radiographic picture. Furthermore, IOPA X-ray could only reveal gross coronal destruction. 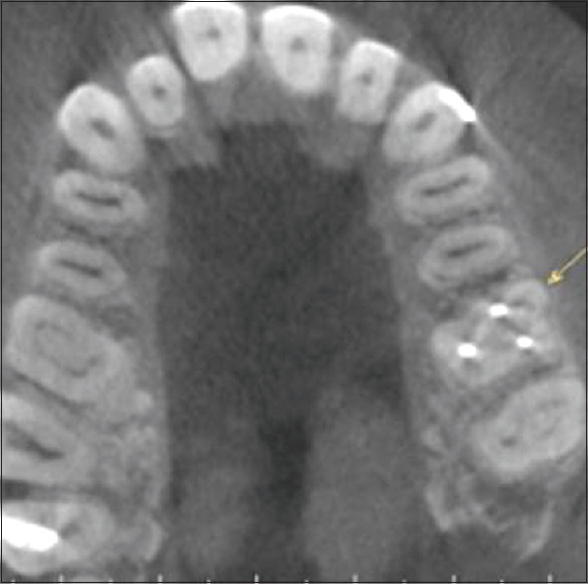 However, CBCT scans clearly showed a supracrestal perforation. Probably, the previous treating dentist mistook this as the canal orifice and attempted obturation. On realizing their mistake and in an effort to retrieve the gutta-percha, the obturating material got separated. 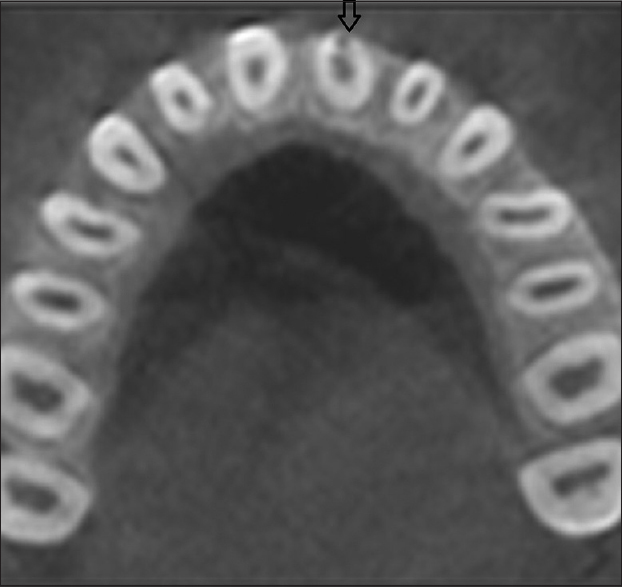 This was clearly visible on the CBCT scan. Considering the age of the patient and the fact that gutta-percha is a biocompatible material, no surgical intervention was performed. In Case 3, two angulated IOPA X-rays (straight on perpendicular and 30° mesial shift) showed the separated instrument impinging on the mandibular canal while the 30° distal shift did not give any conclusive interpretation. 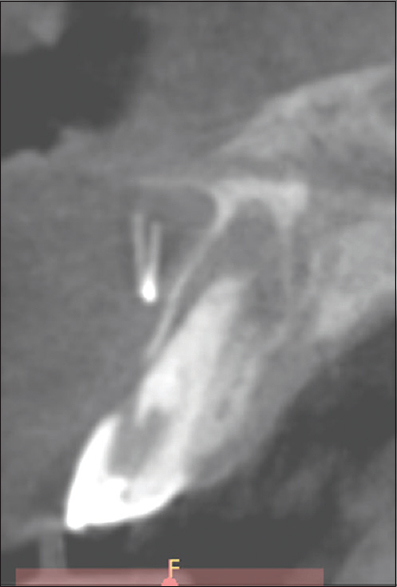 The same tooth, when subjected to CBCT imaging, revealed a 1.4 mm distance between the instrument and the mandibular canal. Taking into consideration the anatomical complexity, intentional reimplantation was opted as the treatment modality. Kumar et al. 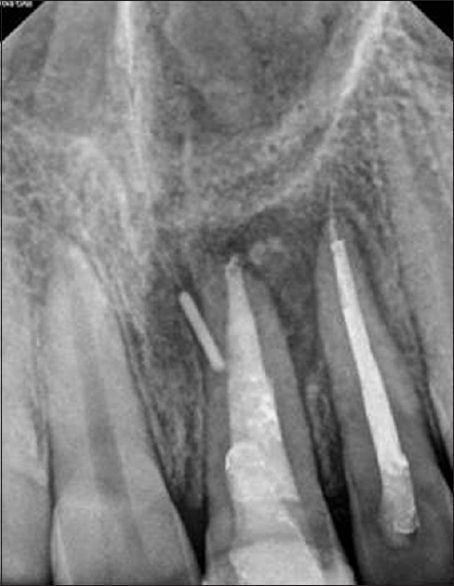 2013 have described intentional replantation as a viable treatment option for specific endodontic cases that provides an added advantage of avoiding surgical complication. These case reports coupled with the literature suggest that CBCT is a “diagnostic boon” in endodontics. Mota de Almeida et al. in their study assessed the impact of CBCT on therapeutic decisions in a defined population. In 53% of cases, there was a change in therapy plan attributed to CBCT. In another study by the same authors (2015), it was concluded that CBCT has a substantial impact on diagnostic thinking in endodontics when used in accordance with the European Commission guidelines. Levin et al. reported a case of retreatment of two rooted central incisor and concluded that during the treatment of teeth with an anatomic variation, CBCT imaging can serve as an auxiliary tool for 3D evaluation and this influences treatment steps and techniques. Fuji et al. 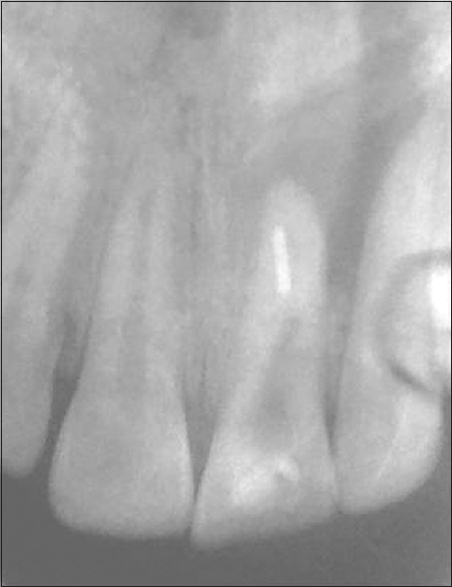 reported a case where a 42-year-old Japanese male was treated for apical periodontitis of maxillary second premolar based on clinical findings and IOPA X-ray. However, on failure to respond to treatment, CBCT was performed and diagnosis was changed to that of apical periodontitis of upper first maxillary premolar. Hence, CBCT has been considered as the imaging modality of choice for patients who present with contradictory or nonspecific clinical signs and symptoms associated with untreated or previously endodontically treated teeth., Limited FOV CBCT is valuable in intra-appointment identification and localization of calcified canals, extra canals, complex morphology, and dental anomalies.,, This imaging modality is also useful when conventional IOPA X-rays are inconclusive in the detection of vertical root fractures,,, in diagnosis and management of traumatic injuries including root fractures, luxation, localized alveolar fractures, and dentoalveolar trauma. 3D imaging has taken precedence in cases of nonsurgical retreatment to assess complications in the form of overextended obturating material, separated instruments, and perforations. It is also immensely utilized in presurgical treatment planning to locate root apices, evaluation of proximity to anatomic structures,, and for surgical placement of implants. It plays an important role in localization and differentiation of external and internal resorptive defects, and for outcome assessment. However, in spite of extensive applications of CBCT, radiation still remains a matter of concern. Effective dose from large FOV CBCT is in the range of 30–200 μSv. Comparing this with an orthopantomogram (19–75 μSv,) and periapical radiograph (6 μSv), it is still 3–6 and 8–14 times higher, respectively. Decreasing radiation exposure may be accomplished by decreasing the field size and therefore, limiting the field of view. For most endodontic applications, limited/focused view CBCT is preferred to improve diagnostic accuracy, decrease radiation exposure to the patient, save time due to smaller volume to be interpreted and focus on anatomical areas of interest. Majority of complex endodontic cases can be discerned with a limited FOV in which the effective radiation dose varies from 4.7–38.3 μSv. According to AAE, this radiation can further be minimized by following the fundamental principle of As Low as Reasonably Achievable. As seen in the above-discussed cases, the additional information provided by CBCT influenced clinical decision-making and aided in rendering appropriate treatment to the patients. If this diagnostic tool is used judiciously and selectively, it can be an indispensable imaging modality. We would like to thank Dr. Sidhartha Sharma for contributing case 1. American Association of Endodontists, American Acadamey of Oral and Maxillofacial Radiography. AAE and AAOMR joint position statement. Use of cone-beam-computed tomography in endodontics. Pa Dent J (Harrisb) 2011;78:37-9. 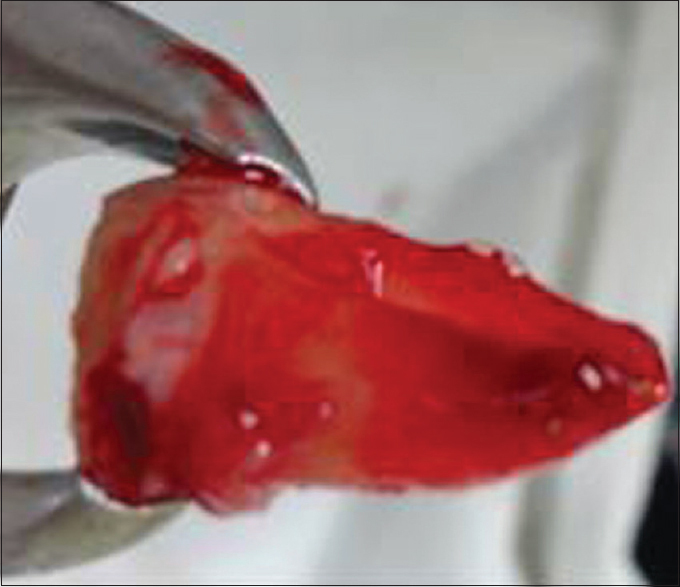 Kumar V, Logani A, Shah N. Intentional replantation: A viable alternative for management of palatogingival groove. Saudi Endod J 2013;3:90. Mota de Almeida FJ, Knutsson K, Flygare L. The effect of cone beam CT (CBCT) on therapeutic decision-making in endodontics. Dentomaxillofac Radiol 2014;43:20130137. Mota de Almeida FJ, Knutsson K, Flygare L. The impact of cone beam computed tomography on the choice of endodontic diagnosis. Int Endod J 2015;48:564-72. Levin A, Shemesh A, Katzenell V, Gottlieb A, Ben Itzhak J, Solomonov M, et al. Use of cone-beam computed tomography during retreatment of a 2-rooted maxillary central incisor: Case report of a complex diagnosis and treatment. J Endod 2015;41:2064-7. Fujii R, Suehara M, Sekiya S, Miyayoshi N, Asai T, Morinaga K, et al. CBCT-based diagnosis of periapical lesion of maxillary first premolar mimicking that of second premolar. Bull Tokyo Dent Coll 2016;57:291-7. Yılmaz F, Kamburoglu K, Yeta NY, Öztan MD. Cone beam computed tomography aided diagnosis and treatment of endodontic cases: Critical analysis. World J Radiol 2016;8:716-25. Rahimi S, Mokhtari H, Ranjkesh B, Johari M, Frough Reyhani M, Shahi S, et al. Prevalence of extra roots in permanent mandibular first molars in Iranian population: A CBCT analysis. Iran Endod J 2017;12:70-3. Shetty H, Sontakke S, Karjodkar F, Gupta P, Mandwe A, Banga KS, et al. Acone beam computed tomography (CBCT) evaluation of MB2 canals in endodontically treated permanent maxillary molars. A retrospective study in Indian population. J Clin Exp Dent 2017;9:e51-5. Saberi E, Mollashahi NF, Movasagh Z, Moghaddam AA, Mohammadi A. 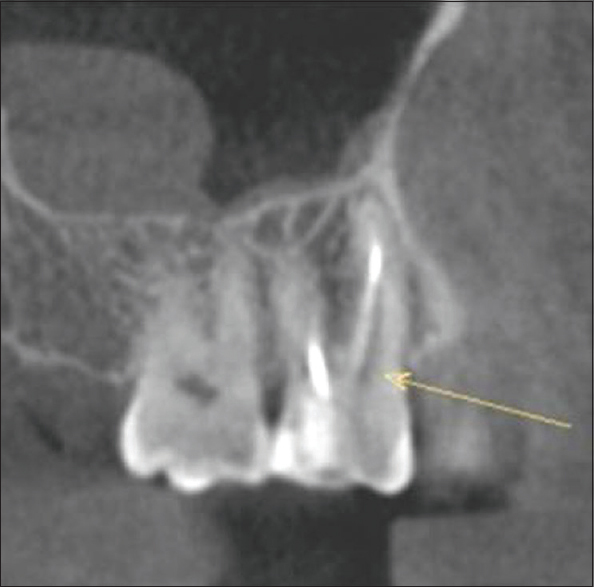 Value of CBCT in vertical root fracture detection in endodontically-treated teeth. Minerva Stomatol 2017;66:69-74. EzEldeen M, Van Gorp G, Van Dessel J, Vandermeulen D, Jacobs R 3-dimensional analysis of regenerative endodontic treatment outcome. J Endod 2015;41:317-24. Chang E, Lam E, Shah P, Azarpazhooh A. Cone-beam computed tomography for detecting vertical root fractures in endodontically treated teeth: A Systematic review. J Endod 2016;42:177-85. May JJ, Cohenca N, Peters OA. 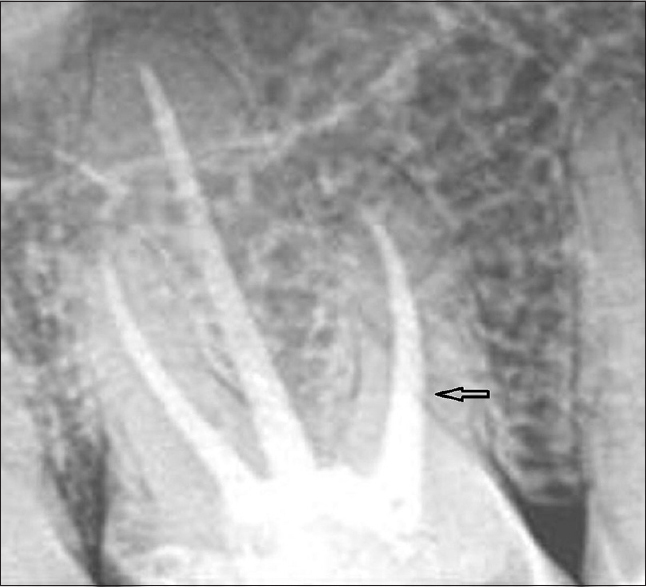 Contemporary management of horizontal root fractures to the permanent dentition: Diagnosis – Radiologic assessment to include cone-beam computed tomography. Pediatr Dent 2013;35:120-4. Aydemir S, Helvacioglu-Yigit D, Sinanoglu A, Ozel E. Retreatment of a maxillary lateral incisor with two separate root canals confirmed with cone beam computed tomography. J Clin Med Res 2015;7:560-3. Hiremath H, Agarwal R, Hiremath V, Phulambrikar T. Evaluation of proximity of mandibular molars and second premolar to inferior alveolar nerve canal among central Indians: A cone-beam computed tomographic retrospective study. Indian J Dent Res 2016;27:312-6. Chong BS, Gohil K, Pawar R, Makdissi J. Anatomical relationship between mental foramen, mandibular teeth and risk of nerve injury with endodontic treatment. Clin Oral Investig 2017;21:381-7. Silva JA, de Alencar AH, da Rocha SS, Lopes LG, Estrela C. Three-dimensional image contribution for evaluation of operative procedural errors in endodontic therapy and dental implants. Braz Dent J 2012;23:127-34. Lima TF, Gamba TO, Zaia AA, Soares AJ. Evaluation of cone beam computed tomography and periapical radiography in the diagnosis of root resorption. Aust Dent J 2016;61:425-31.